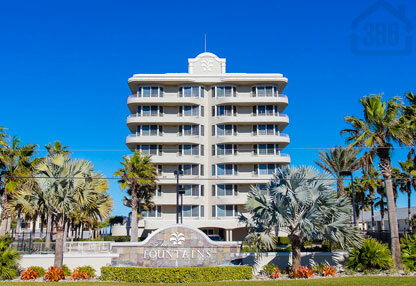 The Fountains in New Smyrna Beach, Florida is an exquisite condominium with private, gated access that offers unparalleled privacy and luxury in these sprawling oceanfront condos. Upon entering your new residence in The Fountains you are greeted by abundant natural lighting and the sound of ocean waves through several floor to ceiling sliding glass doors that lead to an oceanfront balcony. Three balconies wrap around the building and provide almost 1400 square feet of living space and spectacular views of Atlantic coastline and the Indian River. Enjoy the soaring ceilings that are over 9 feet in height and the ample bedrooms that each have private baths. The Fountain truly brings the standard of living to the next level.